If you've ever accidentally changed something in your comp and suddenly hundreds of expressions get disabled and after you undo you realize the expression did not get re-enabled? Well if this has happened to you, this will be a life saver. 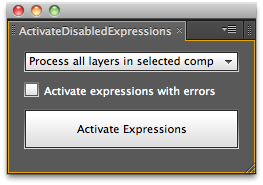 It will go through selected layers, an entire comp or several selected comps and activate any disabled expressions.